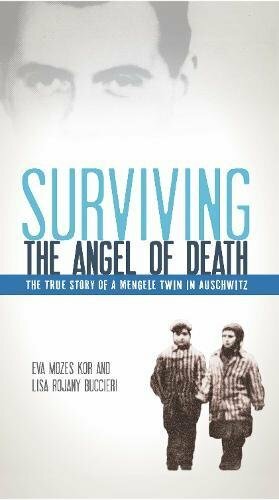 Eva Mozes Kor and her twin sister Miriam survived the Holocaust, because Dr Mengele needed them for medical experiments. Today she is speaking with Wizzley. Holocaust Memorial Day is held annually on January 27th. It commemorates that day in 1945, when Auschwitz was liberated. Eva Mozes Kor remembers it very well. She was there. Liberated just days before their 11th birthdays, she and her twin sister Miriam had lost their entire family to the gas chambers. But they survived due to Dr Josef Mengele's program of genetic experimentation using identical twins. To this day, Eva doesn't know precisely what was in those syringes, which were injected into her arms and nearly killed her. She has forgiven Dr Mengele and all who enacted the Final Solution with him, but never forgotten. She kindly agreed to be interviewed by myself, on behalf of Wizzley, about Holocaust Deniers, forgiveness and healing. Aged just ten years old, the Mozes twins were alone in the nightmare of Auschwitz. Their parents and sisters were lost to the gas chambers there. 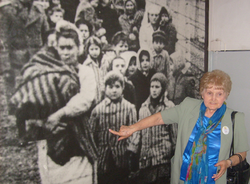 On the selection platform at Auschwitz, Eva Mozes Kor dances the Hora. It is a circle dance, involving much kicking of the feet, which is generally performed at weddings and birthday parties. It's a celebration or, in this case, sheer defiance. It was on this very platform, in May 1944, that Eva and her twin Miriam were torn from the grasp of their desperate mother. Dressed the same, the two ten-year-olds had been correctly identified as identical twins. Kicking and crying out, the girls were carried away by guards, while their mother Jaffa was held back. She was screaming and reaching out for her twin daughters. It was the last that Eva ever saw of her. Their father, Alexander, and two elder sisters, Edit and Alix, had already been lost in the melee. All four were marched into the gas chambers and perished the same day. 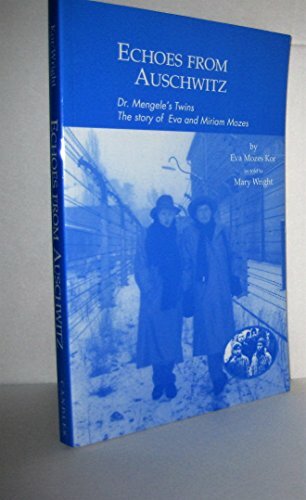 Eva and Miriam survived because their twin status caused them to fall under the dubious protection of Dr Josef Mengele. He needed twins. He used them as guinea pigs in a vast range of medical experiments. As Eva once quipped, "I'd have rather been on Schindler's List, but, you know," She shrugged, "Mengele's List got us through the Holocaust too." You will have seen Eva Mozes Kor before. In that famous footage of the (re-staged) liberation of Auschwitz, she is at the head of a column of children, in the middle, clutching Miriam's hand. Eva is the one who bobs her tongue out at the camera in passing. She's in the photograph above too. She's the young girl peeping out from behind the hat wearing boy in the forefront. Alongside her, Miriam faces the camera full on. They look chubby, well-fed, but that's an optical illusion brought about by the layers of clothing that they are wearing to keep warm. In truth, they were starving. Nor did they habitually wear those iconic striped uniforms. The Russian cameraman asked them to put on those shirts, as it looked better on screen. As Mengele twins, both Eva and Miriam wore clothes with a huge red triangle painted across the back. It made them utterly visible at a distance and stopped anyone randomly killing them. Dr Mengele reserved that right for himself. Eva and Miriam Mozes were at the mercy of the Third Reich's most notorious medical practitioner. A man for whom medical ethics didn't apply. Twins at Auschwitz were afforded slight privileges over the other children. They weren't killed. They kept their own hair. They didn't have to wear the striped uniform. They were fed a tiny bit more. On the flip side, they were used as human subjects in the laboratory of Dr Josef Mengele. It is believed that Dr Mengele was looking for the key to producing twins in any pregnancy, in order to swiftly swell the Master Race. But in reality, he did whatever whim took him at the time. Eva personally witnessed such atrocities as two Roma twins stitched together, back to back, in a bid to artificially create Siamese twins. The unfortunate girls lay screaming for three days, before gangrene set in and they died. She and Miriam understood early on that the norm was for one twin to be experimented upon, while the other was used as a control subject. If anybody died, their twin was immediately killed too. In that way, joint autopsies could show what had (if anything) been changed in the tests. Their time at Auschwitz was marked by a bitter determination that both should survive against the odds. That was naturally a difficult feat to pull off in the circumstances. On one occasion, Eva was given five injections, which caused a soaring temperature. When Dr Mengele examined her, he commented, "It's a shame. She's so young, but she'll be dead within two weeks." She was given neither food, drink nor medicine. But Eva learned that there was a tap at the end of the ward. She forced herself out of bed and crawled, losing consciousness often, to reach the life-saving water. Eva was also assisted once by a nurse, who smuggled in a small piece of birthday cake. Using subterfuge with the thermometer, Eva was able to convince Mengele that her fever had broken. After it was left under her arm, she would remove the thermometer until the reading fell, then push it down enough to stick out on the other side of her arm. He let her return to the barracks after two weeks, where she was able to get more help to recover. The procedures performed on her sister Miriam left her with kidneys the size of a ten year old. In later life, Eva would donate one of her own in order to save her twin's life again. Unfortunately, Miriam contracted a rare form of cancer - also believed to be linked to those childhood experiments - which eventually took her life in 1993. But on January 27th 1945, when the Russians entered Auschwitz to inform its inhabitants that they were now free, Eva and Miriam Mozes were there to receive them. It's that moment which Holocaust Memorial Day marks. Eva Mozes Kor speaks to Wizzley today, as just one of the events occurring internationally, raising awareness of all that happened there in a bid to stop it ever happening again. This discussion took place on January 27th 2014, on the 69th anniversary of the liberation of Auschwitz. The statement, signed by Dr Hans Münch, detailing what he saw in the Auschwitz gas chambers, may be found here. You may also follow Eva Mozes Kor on Twitter at @EvaMozesKor. This is the context within which Eva and Miriam Mozes survived the Holocaust. It makes for grim and heart-breaking reading, but knowledge is our defence against it ever happening again. Visiting Auschwitz-Birkenau State Museum is not everybody's idea of a great holiday destination. But everyone should go there at least once in their lives. Why Would Anyone Deny the Holocaust? For the majority of Holocaust deniers, it's to ensure that genocide can one day happen again. But that isn't the only reason for such willful misinterpretations. The Holocaust subreddit was being run by neo-Nazis and Zionist Conspiracy theorists. Some on Reddit were desperate to take action, but how? The Jewish Ghetto in Krakow was the last stop before transportation to a concentration camp. Its final clearance was immortalized in 'Schindler's List'. As horrific as it is, I can grasp it. That's one of the unseen horrors of the Holocaust, that it can and will happen again. I'm glad that people like you are moved by these stories, as you will help us stop the next one. I can't even grasp how humanity ever let this happen. It is just pure evil. I'm fighting tears as I write this. I feel so bad for what all of these people went through. I know I'm late in reading this but what a powerful piece. Well done Jo. I've certainly seen the inspiration behind fiction too. Human centipede anyone? Unfortunately, Dr Mengele inspired some of the seriously grisly science fiction I've read over the years too. Not often I have to go and throw up after reading a book, but some of the short SF by Piers Anthony and others whose names I have (mercifully, perhaps) forgotten over the last 40 years was surely inspired by his doings. Ethics? Human lab rats, more like it. Wow, only 160 survivors. Imagine what they were put through -- considering that these twins, if I understand correctly, were not killed otherwise than through Dr. Mengele's experiments. Yes, there were 160 survivors out of the approximately 3000 twins subjected to those experiments. Eva is a truly exceptional woman. This is exceptional work, Jo! Eva has really great strength. When I first read about the experiments on twins few years back, I was often disturbed by the thoughts about the children who had to go through it. I never knew there were survivors. It's quirky and so frightfully British! All that can be said of a stiff, upper lip is in this war-time slogan. But it was never seen at the time.